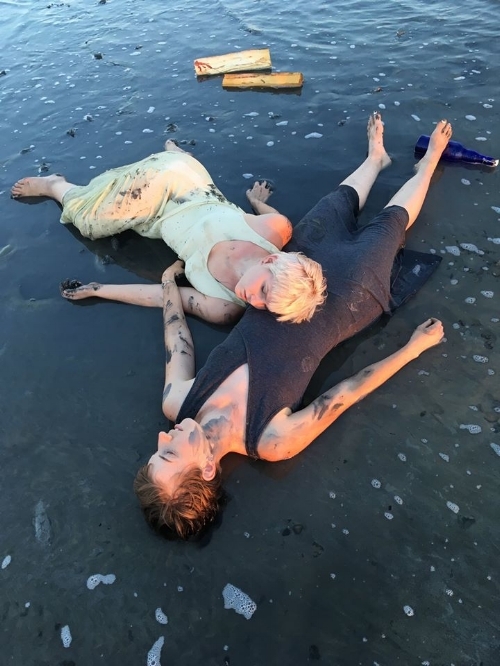 In Red Lake, presented by Deseret Experimental Opera Company as part of the Great Salt Lake Fringe Festival, Producer/Librettist Luke Swenson, Composer/Performer Stuart Wheeler, and Choreographer/Director Emma Wilson created a post-modern marriage of music, poetry, and dance. Each creator wore multiple hats and multiple layers of costuming—the musicians were clad in brightly colored, slightly grubby skirts over pants while the singers and dancers sported layers of well-worn gowns in different shades of green, red, and white— creating an aesthetic effect that was circus-meets-hiking-hippies. Red Lake unfolds a dystopian, disrupted tale of three campers—Ian, Melody, and Judith—on an ill-fated trip to Antelope Island. The characters arrive at the Great Salt Lake, hike around, fall in love (kind-of), get lost, and ultimately – die. Presented in five ”Images,“ each character was played by both a singer and a dancer. The dancers’ roles fluctuated between their human character, a Greek chorus, and different creatures of the Great Salt Lake ecosystem. This interplay of human, dancer, and other-than-human sparked compelling images, as when Judith (sung by Hannah CJ McLaughlin) faced the audience straight on, singing about the rain while her counterpart (danced by Amy Freitas) playfully tapped raindrops along her arms. Later, Ian(s) and Melody(s) floated back-to-back across the extremely salty North arm of the Great Salt Lake, their heads resting boom-box style on each other’s shoulders, making it difficult to see whose head belonged to whom. In these moments, I felt the duets became something more than a dancer translating the libretto into movement. 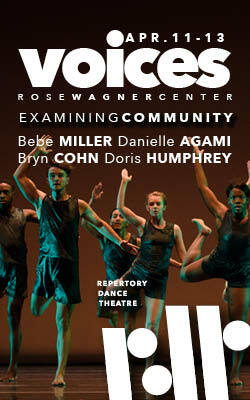 In other moments, the relationship between singer and dancer felt aimless. I began to consider what mechanisms help a dancer having an experience onstage (such as the feeling of a bird in flight, or being dehydrated on a beach) to give the audience a comparable sensation. When the performers frantically threw lawn chairs and wood pallets into a large bonfire, my actual fear of being hit by a chair amplified the ambience of the wailing music and thudding set pieces. But when the dancers lingered in repetitive improvisations, disengaged from their singing partner, I was a bit lost at sea. The detailed program notes offered multiple anchors for the live action, yet I wished that more had been left to the stage rather than the page. Liz Ivkovich is the New Media Coordinator for loveDANCEmore and edits the loveDANCEmore performance journal. This article is published in collaboration with loveDANCEmore.org.